'Now 3 Pullman Diesel Services', BR poster, 1961. 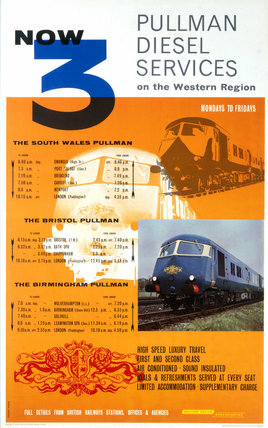 Poster produced for British Railways (BR) to promote the company's three new Pullman diesel services, with routes serving South Wales, Brighton, Birmingham and London. Artwork by Vincent Power.